Home > News > What Drives Electricity Prices? Energy prices can fluctuate on a regular basis. But what drives this fluctuation in prices, and what types of electricity plans are available to help you get the best deal? An electricity bill is made up of costs relating to your electricity consumption (known as commodity costs), and then additional third party charges (known as non-commodity costs). The majority of your business electricity bill is made up of the costs your energy provider pays for your electricity from the wholesaler. The total amount on your bill varies depending on how much electricity you use. Transmission Network Use of System (TNUoS) – The cost for the supplier transporting and distributing your electricity along with the maintenance of the National Grid. Distribution Use of System (DUoS) – Charges from the Distribution Network Operators (DNO) for installing and maintaining the local distribution networks. Climate Change Levy (CCL) – Specifically for businesses, this levy is designed to encourage businesses to improve their energy efficiency and reduce their carbon footprint. This varies with the amount of energy that your business uses. Renewables Obligation (RO) – This scheme ensures that all licensed electricity suppliers are obliged to source a specified proportion of their electricity from renewable energy. Its aim is to encourage the deployment of large-scale renewable energy in the UK. Feed-In Tariff (FiT) – The Government launched this scheme to support small-scale power generation e.g. wind turbines and solar panels. It encourages energy businesses to generate their own renewable, low carbon electricity. Electricity Market Reform (EMR) – This aims to maintain security of supply while keeping energy bills affordable and increasing low-carbon generation. It includes two support schemes to incentivise the development of new projects. Capacity Market (CM) – This scheme was set up to ensure there is enough reliable energy available to meet the countries demand, while keeping electricity supplies at affordable prices. CM charges are based on your consumption during a specific time bracket in Nov to Feb; this determines your market share. Contracts for Difference (CfD) – Supports, incentivises and pays low carbon generators to develop new projects. This cost varies annually depending on wholesale price fluctuations and the amount of CfD generation produced each year. WHAT CAUSES FLUCTUATIONS IN ELECTRICITY COSTS? 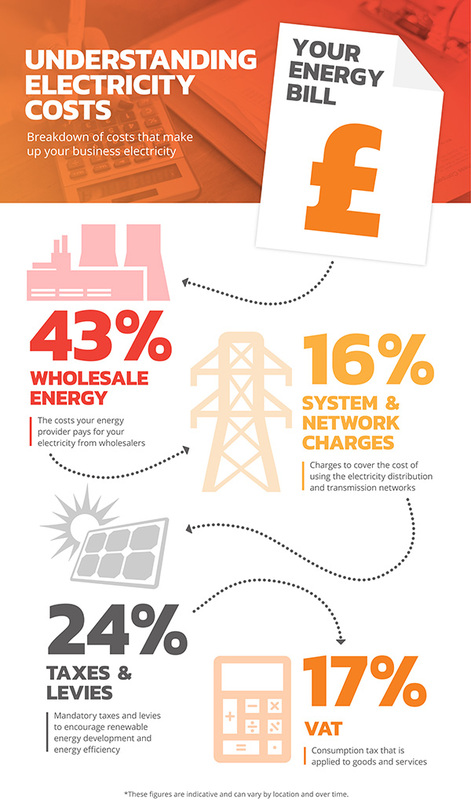 There are a number of factors that affect the price of business electricity. The main commodity cost of your electricity is largely influenced by supply and demand, for example during winter months there is an increase in usage which is therefore reflected in the cost. Stress events, such as cracks in oil pipelines and explosions at gas hubs limit the supply which in turn can impact price. Import/export issues, such as the value of currency and fuel costs, also have an impact on prices. The remaining non-commodity costs can fluctuate depending on issues such as government priorities, transportation costs and changes to third-party charges. There are actions that you can take to help mitigate against these fluctuations in price. Most electricity suppliers will offer a range of different tariffs to help budget your costs more effectively, so they will be able to advise on the most suitable for your business. At Yü Energy we have different electricity plans available to help you budget your electricity costs. Our plans can be tailored to your specific business needs so there are no surprises and you can see exactly what you’re paying for. 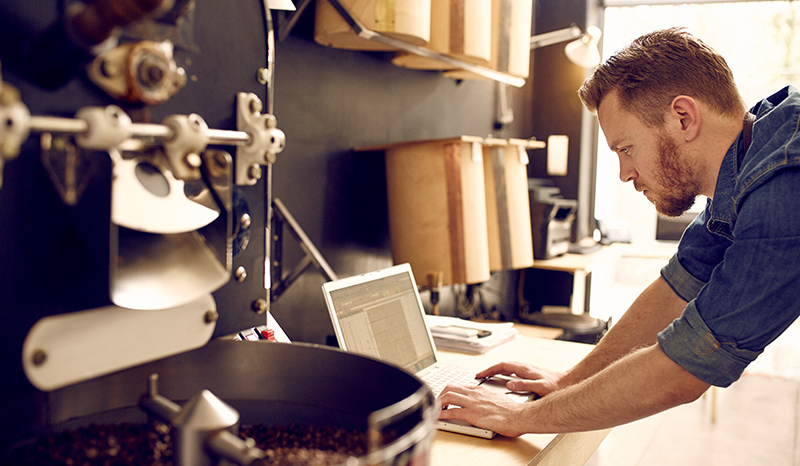 Great for small-medium businesses who need a consistent energy plan for budget tracking, peace of mind and no additional hidden charges. Fixed Term contracts allow you to fix the amount per unit (kWh) that you pay for your energy. It does not fix the amount you pay each month, but it does protect you from energy price increases for the duration of your contract. At Yü Energy, we offer Part-Fixed contracts which are ideal for businesses who want more flexibility over how to manage their non-commodity costs whilst maintaining a fixed rate for their energy costs. For more information on our different tariffs, please visit our website. Prepayment electricity plans give more power and control to a business. They are ideal for budgeting finances and avoiding unexpected bills. If you want more information about our contracts at Yü Energy, give our friendly team a call and we’ll help you find the best option for your business.